Ad execs, take heart! At least New York magazine thinks some of you are influential. 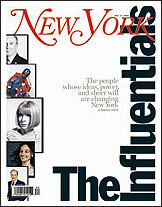 In its cover story, called “The Influentials,” the weekly does a relatively good job of naming who in advertising counts for something these days—better than the uninformed perspectives we so often see in other publications. Oh, right, let’s get to it. The five-plus-two New York ad execs that got the nod this year (in the print magazine’s order) are: Irwin Gotlieb of WPP’s Group M; John Wren of Omnicom; Bob Greenberg of IPG’s R/GA; Tim Armstrong, vp of ad sales at Google (only Tim qualified for a photo shoot); Jon Kamen of @radical.media; and “The Swedes”—Linus Karlsson and Paul Malmstrom of Mother. Also of note: Mike Shaw, president of sales and marketing at ABC, made the list under TV and radio, but mostly, if you follow his write-up, because “many see his innovations as the future of ad-supported television.” AdFreak came up well short, but The Consumerist got a nice mention in Nick Denton’s bio.